It’s hard going back to school when you’re “older.” It can be quite challenging. For me, however, well, …. the stars aligned, giving me the time to really evaluate what I wanted out of life. I think what sabotages our thinking is “money.” That, and our “age.” I think this experience has been the best gift I could have EVER given to myself regardless of the financial expense/burden. Originally, I set out to attend the Northwest School of Wooden Boatbuilding. I took out a student loan and by the third quarter, I decided to abandon ship and set sail on a different adventure, answering the call to attend the Port Townsend School of Woodworking. Financially, it was a setback, but I knew the education I was seeking was at the Port Townsend School of Woodworking. I really wanted to learn the basic core foundations of woodworking. I wanted more intimacy with hand tools vs. power tools. I wanted to be more creative. I wanted more self-expression. I wanted to fall deeper in love with the wood and the grain. So, as painstakingly as the next step was, I took out a few pensions to make it possible to attend this school. Unfortunately, the school’s Fall Intensive Foundations of Woodworking class was full, but I didn’t give up. I was 9th on the wait-list and made it! I couldn’t believe it but I was extremely thankful. I was also extremely grateful to Ann Eastwood and Mike Rainey for awarding me with a scholarship that also made this possible. It made it easier for me to handle my other financial setback and gave me hope for what all I did to get here and be here. As to my journey, as to what got me here and brought me here, well, it’s been more of a personal one … mainly for purpose, development, and fulfillment. I call it my phase II in life. I really wanted to get back in tune with my creative side. I saw myself as being like a pile of wood that’s just sitting there … wanting to BE something. Throughout my life, I have stumbled, and I have chosen paths … I have traveled in directions that haven’t really been mine – mostly due to “swayers” and naysayers. That’s really what got me off my artistic path and away from my true calling or passion. The younger version of me loved to draw. And sadly, I haven’t picked up a pencil and drawn much of anything in the past 20+ years. The 30’s me liked fixing things around the house, watching HGTV, and I always had a crazy dream of building a log house. The tools felt therapeutic in my hands. And let’s just say, while I still age, something inside keeps nudging me to get back to that creative side. It’s funny how the wind blows and how the waves change and how one finds a way to stay buoyant. I have been my own “craftsman” picking up my pieces … “shaping” and “chiseling” ME. 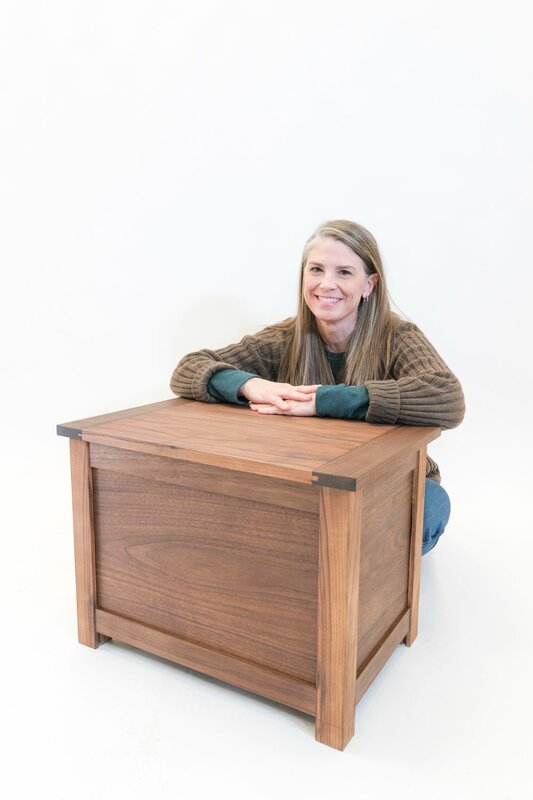 I chose the Port Townsend School of Woodworking because I wanted to obtain the best knowledge and skill that would benefit my life for success. I wanted to be surrounded by the most skilled craftsmen to gain the knowledge, support, and experience of the trade. The Foundations of Woodworking Intensive Course truly challenged me on so many different levels, mentally and physically. Personally, I felt like I was being broken down and it was up to me to build myself back up through the many difficult challenges that I faced. I felt overwhelmed, at times, with unfinished projects piling up. (And on a humorous note, perhaps I should’ve gone to all the free yoga classes during lunch to help release some of my stress). Every project introduced in class was a stepping stone for the next project. I even like how the final project was something that I designed. It’s really neat to see how everything comes together in the end and how I rewarded myself with a frame and panel chest that I drafted on a piece of paper and brought to life. The hard part was the process but the value is falling in love with what the process creates. I came here to craft my second career into something beautiful and meaningful the same way, in which, that pile of wood goes from being just a pile of wood to something beautifully handcrafted. That creation of beauty, value, and quality is the ultimate REWARD. As I got older, I learned to take risks, that’s truly when I began to LIVE. In the end, when I look back on my life, I will smile at what I have done rather than regret what I haven’t. And oh, to be a piece of wood that I have left a beautiful mark on through my very own hands, skill, passion, labor, and heart … and know that piece of wood will probably outlive my life, be appreciated, and be SEEN. There’s a beauty in that. The goal: setting myself up for a lasting career that ends up being my ultimate masterpiece. Stay tuned!